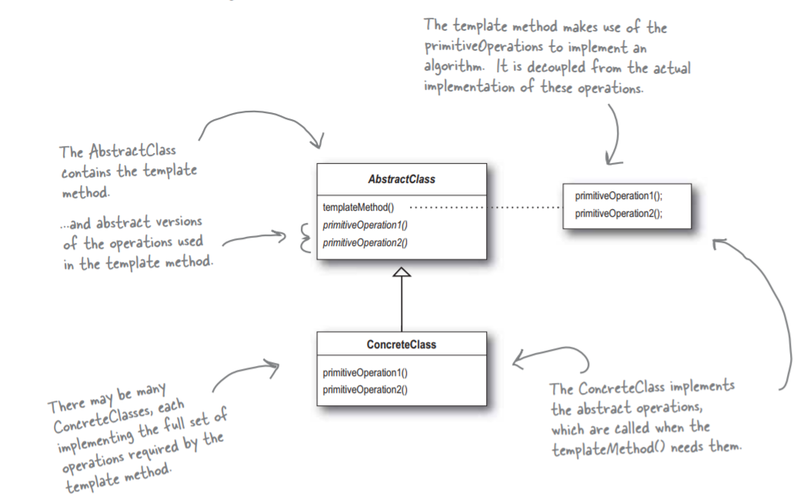 In this post, we will learn Template Method Pattern implementation with examples from Head First Design Patterns Book. steps of an algorithm without changing the algorithm's structure. To implement the invariant parts of an algorithm once and leave it up to subclasses to implement the behavior that can vary. When common behavior among subclasses should be factored and localized in a common class to avoid code duplication. This is a good example of "refactoring to generalize" as described by Opdyke and Johnson. You first identify the differences in the existing code and then separate the differences into new operations. Finally, you replace the differing code with a template method that calls one of these new operations. To control subclasses extensions. You can define a template method that calls "hook" operations at specific points, thereby permitting extensions only at those points. Don't call us, we will call you. The connection between the Hollywood Principle and Template Method pattern is probably somewhat apparent: when we design with Template Method Pattern, we are telling subclasses, "don't call us, we'll call you." This connection between the Hollywood Principle and Template Method pattern explained in the example. Let's implement Coffee Beverage example from Head First Design Patterns Book. StarBuzz Coffee Recipe Let's start with the recipe. StarBuzz Tea Recipe Let's start with the recipe. Follow the steps to implementation of a Template design pattern. Step 1: Create CaffeineBeverage class, which defines a skeleton for the algorithm. Step 2: Create a Coffee class, which extends an abstract CaffeineBeverage class and implements abstract methods. Step 3: Create a Tea class which extends an abstract CaffeineBeverage class and implements abstract methods. Step 4: With a hook, we can override a method or not, It's our choice, If we don't then abstract class provides a default implementation. 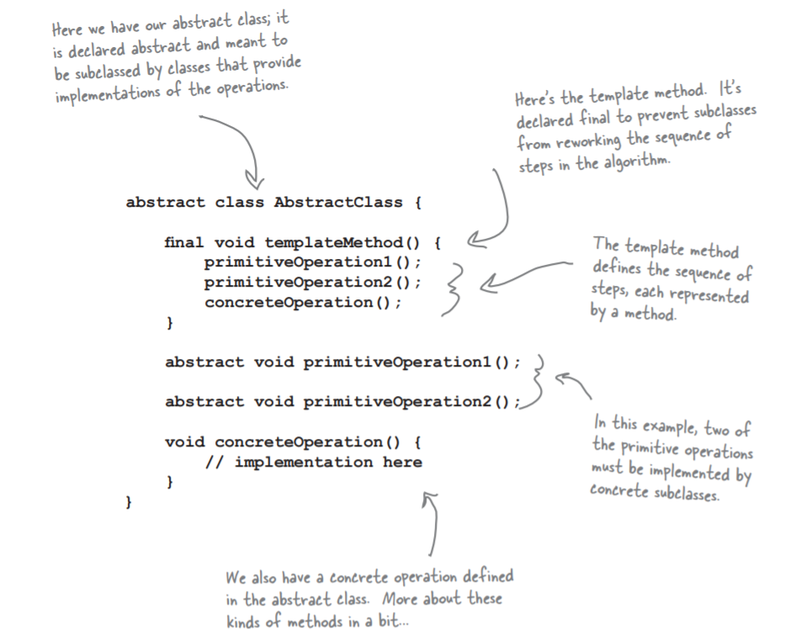 Step 5: Let's override the hook() method and provide the own implementation. Step 6: Test the above implementation. Let's create a hot coffee and hot tea, here customer needs to decide whether he/she wants condiment by an input. In this post, we have learned the Template Method Pattern from Head First Design Patterns book. There is a separate post for Factory Pattern in detail with examples, advantages, real-world examples.